The most common voltage output signals, especially where power consumption is not an overriding consideration*, are 1-5VDC output for industrial applications, and 0.5-4.5VDC ratiometric for automotive applications. 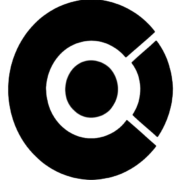 With the growth of IoT & IIoT projects that incorporate sensors, the capability to operate from low power with less current consumption is valuable, especially for equipment being deployed in remote areas where frequent battery changes are costly and time consuming. To address low power needs, there are a number of voltage output options that can be powered from 3V, 3.3V, 3.7V, 5V, and 9V power supplies and batteries. The voltage output signals commonly paired with these supply are*: millivolt, 0.5-2.5VDC, 0.5-4.5VDC, and 1-5VDC. (The option for 0.5-2.5VDC output is rapidly growing in popularity because of the increased use of 3 to 5VDC lithium ion batteries). While the millivolt signal is a ratiometric signal, the term ratiometric is most commonly paired with 0.5-4.5VDC output, which is ratiometric to a regulated 5VDC excitation. The ratiometric output signal 0.5-4.5V output signal became widely popular in automotive and off-road applications. With vehicles using a 12V supply, users could regulate the voltage down to 5V, and create a signal that is proportional to the supply. A 10% reduction in supply from the 5V supply creates a proportional 10% decrease in the output signal. It is still used in similar applications and has also been utilized in industrial applications such as compressors and water pumps. * See table for excitation voltage requirements. Voltage signals aside, perhaps the most common output signal for all industrial pressure and temperature sensors is the two-wire, 4-20mA loop-powered output signal, also referred to as current output. 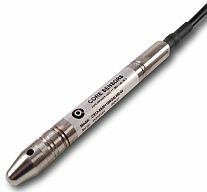 Core Sensors offers nearly all sensor types with 4-20mA output signal option which measures a 4-20mA current in the loop instead of voltage. Learn more about current output signals here. Tank Level Monitoring – For tank level applications, a voltage output pressure sensor packaged with an IP-68 rating can be packaged with a SCADA system to remotely monitor fuel or water level for remote installations requiring low current consumption due to battery life concerns. The CS12 OEM submersible pressure transducer and CS13 slim submersible pressure transducers are designed with a low current consumption ASIC to perform in this application. Oil Field Equipment – In remote oilfields, voltage output pressure sensors and temperature sensors reduce use less battery life while providing enough signal to measure the media and transmit the signal to the telemetry unit. Data is then sent to the cloud for analysis an monitoring. iIot – Industrial applications continue to take advantage of IoT technology. Factories are measuring pressure and temperatures of test equipment as well as automation equipment to maximize efficiency, especially in locations where it is too costly or difficult to run power. HVAC and Refrigeration – Voltage output signals continue to be a popular option amongst HVAC/R OEM and service installations. Due to the low cost and ease of use, pressure, temperature, and combination sensors can all be quickly integrated with noise immunity within the commonly short distances where sensors are run in HVAC automation applications, such as boiler rooms. 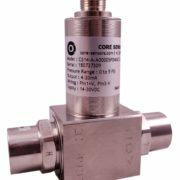 Products such as the CS30 ceramic pressure transducer and the CS10 industrial pressure transducer can be designed with a voltage output signal from low to high volume applications.